"With her gentler and more relaxed personality, Nam Phon proved to be a brilliant match." 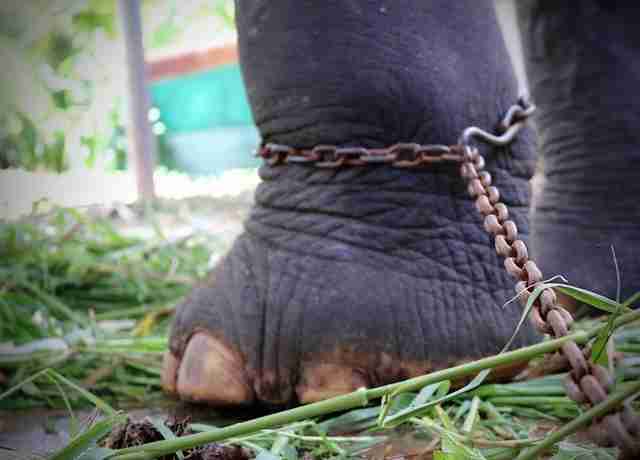 Wassana, an Asian elephant, spent her life not being treated as an elephant, but as an object - a means to an end. She never knew the joy of growing up alongside her mother in the wild. 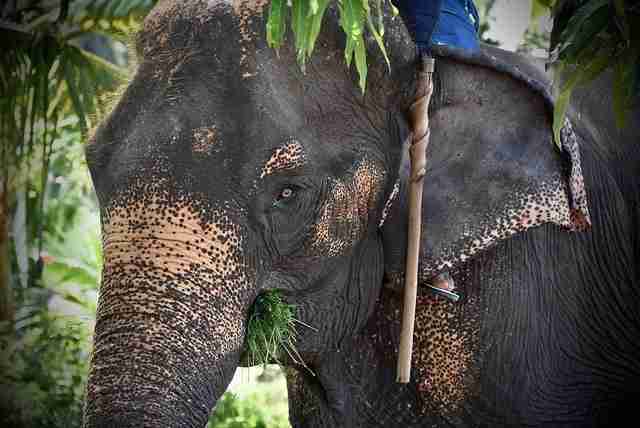 Instead, she was more than likely stolen as a young calf and made to work in the logging industry, according to Wildlife Friends Foundation Thailand (WFFT). "It is believed that Wassana would have tangibly worked in the logging industry where she was forced to contribute to the destruction of her own habitat through felling and lifting heavy logs up out of the jungle tracks," Lilli Ecmanis, tours and education manager at WFFT, told The Dodo previously. It is believed that after the use of elephants for logging became illegal in the 1980s, the former logging elephants were made to work in the tourism industry. However, most of the difficulties Wassana faced for 45 years of her life are unknown. 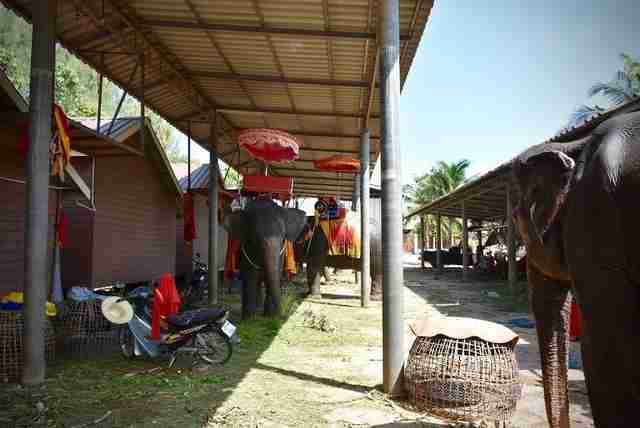 Ecmanis said that is because Wassana has had many owners throughout her life - a result of being moved around to make the most of her through sales, renting and exploitation in tourism camps. WFFT first learned about the elephant while rescuing another who worked at the same tourism camp as her. Wassana sported a large abscess on her leg, which, according to her owner at the time, was a condition that came and went - yet he never took her to see a veterinarian. In addition to the abscess on her leg, Wassana also had an infection on her forehead from open wounds caused by bullhooks, sharp instruments that are often used to strike and control captive elephants. She was also malnourished and obviously had not been bathed regularly. Her legs were in chains. 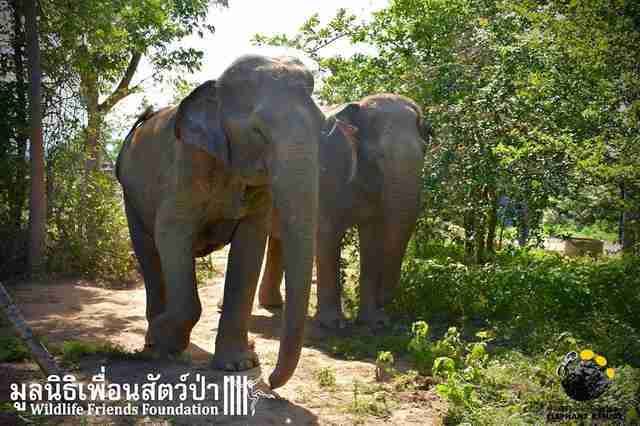 When Wassana's owner expressed interest in retiring her, WFFT decided to welcome her to its elephant sanctuary. After a successful round of fundraising, WFFT was able to take Wassana away from her tourism camp, located in Thailand's Ratchaburi province. 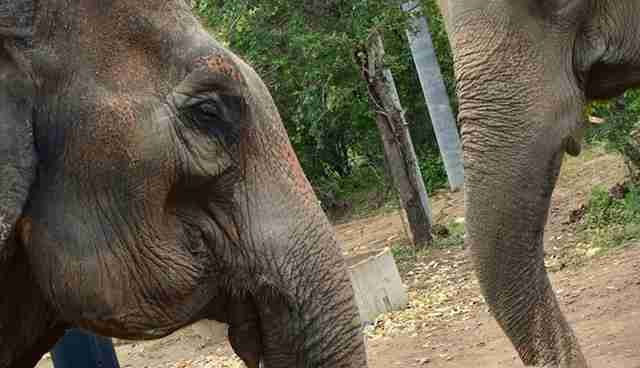 Despite her sad past, Wassana proved to be a friendly, open elephant - and was curious about her new home at WFFT's Elephant Refuge, as well as the rescued elephants who lived there with her. "Elephants are incredibly social animals, however when they are kept in captivity for many years they are often kept alone and without the chance to interact with others as they would do in the wild," WFFT wrote on Facebook. "It's not always easy for elephants to make new friends after 40 to 50 years of solitude." 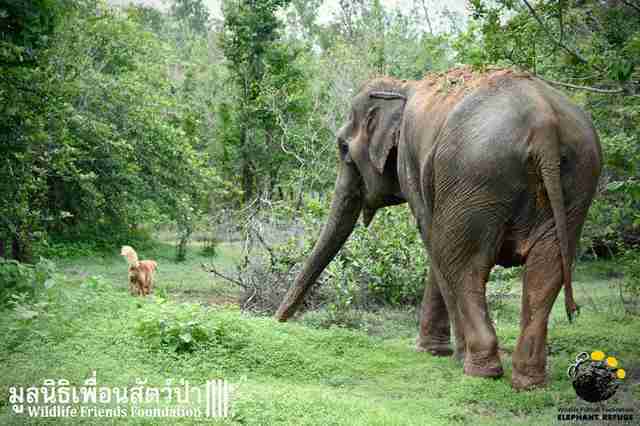 WFFT first tried pairing Wassana with Jele, a female senior elephant. Although the two had a promising start, in the end, Jele's confidence was too daunting for Wassana. 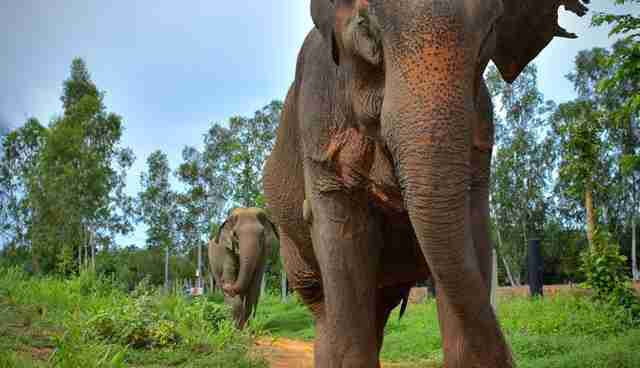 After giving Wassana more time to herself, WFFT introduced her to Nam Phon, a 55-year-old female elephant. The two were allowed to spend time together in the same enclosure all day, though they were separated at night. It soon became apparent that they were perfect for one another. "With her gentler and more relaxed personality, Nam Phon proved to be a brilliant match for the shy Wassana," WFFT wrote. 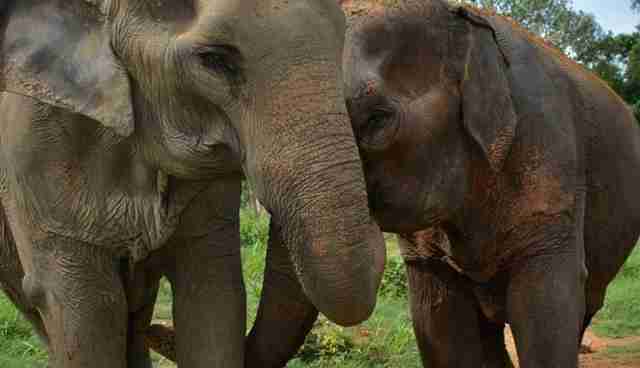 "These two recently rescued elephants are fast forming a very close friendship, which we hope will only grow stronger as time goes on and they can enjoy their retirement together." 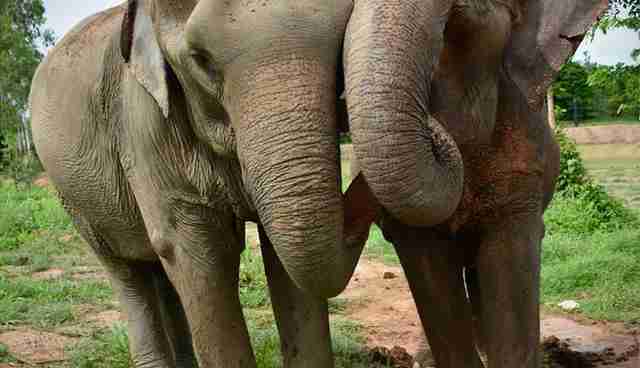 Want to support Wassana and Nam Phon, and help WFFT rescue more elephants like them? You can make a donation here.